85 days. Allium schoenoprasum. Perennial. Open Pollinated. Plant produces heavy yields of chives. The dark green leaves have a mild onion flavor. Use fresh or freeze for year round use. 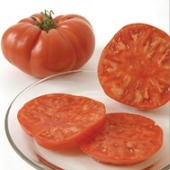 Perfect in salads, stuffed eggs, baked potatoes, soups, omelettes, cream cheese, sauces, and garnishes. Cuttings can be made all season long. 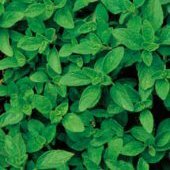 A herb that can be planted indoors or outdoors. 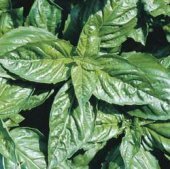 Suitable for containers and for hydroponics gardening. They are great in patio pots, planted directly in the garden, and used as borders. Great as companion planting, as it is said that chives planted along side carrots improves their growth. 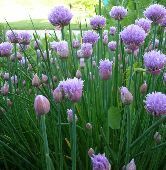 Chives lavender flowers attract bees, butterflies, and other beneficial insects. Excellent choice for home gardens. United States Department of Agriculture, PI 261639. Planting Instructions: Plant seeds ¼" deep. Seeds can be sown in March or autumn. Divide clumps every 3 or 4 years.